Welcome to the mcdadesnursery.com website terms and conditions of use. The terms 'McDade's Nursery' 'The Nursery' 'Nursery' 'McDade's' or 'us' or 'we' refers to the owner of the website whose address is 1000 North Tool Drive, Highway 271, Tool, TX 75143. The term 'you' refers to the user or viewer of our website. 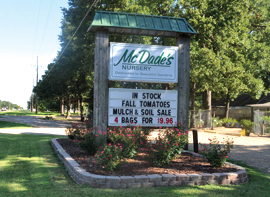 "We drive from Corsicana just to visit a real Nursery - McDade's"